Join the Cafe Brazil Team! Café Brazil is now interviewing for Assistant Managers. Restaurant experience is preferred. Some fast track opportunities to General Manager exist, as company growth is expected in the near future. Overnight shifts are available. Please submit resumes to mail@cafebrazil.com. Cooler temperatures are a sure sign that the holidays are approaching and Cafe Brazil is pleased to announce that our new Holiday Menu will be available in all 10 Dallas-area locations on Tuesday, October 12, 2010. This years menu features 3 entrees, 2 desserts and 6 specialty beverages. We are bringing back favorites like our Holiday Blend coffee and S’mores Latte and introducing a few new items sure to become Cafe Brazil classics! 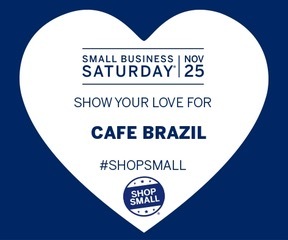 Cooler temperatures means that Cafe Brazil’s Holiday Menu is baack! New specialty entrees and delicious coffee drinks are ready to be enjoyed. All coffee drinks and new flavors by the pound hit stores Tuesday, October 5. Entrees will arrive in-store a week later on Tuesday, October 12. Enjoy! Cafe Brazil is joining forces with the NTFB to raise funds in the month of October. Click on this link to donate to the North Texas Food Bank (NTFB). We’d like to ask you to make a minimum $10 donation to the cause. You’ll receive an e-mail confirmation of your donation. Print if off (Or show us the email on your smartphone) and bring it in anytime between November 1-5, 2010 and we’ll give you any entree of your choice for FREE!